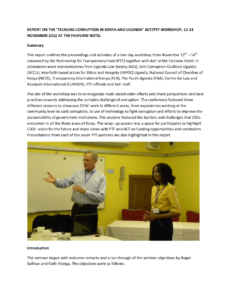 This report outlines the proceedings and activities of a two day workshop from November 12 – 14, 2012, convened by PTF together with local Kenyan civil society organization, ACT. The aim of the workshop was to bring together Ugandan and Kenyan CSOs, re-invigorate multi-stakeholder efforts and share perspectives and best practices towards addressing the complex challenge of corruption. The conference featured three different sessions to showcase CSOs’ work in different areas, from experiences working at the community level to curb corruption, to use of technology to fight corruption and efforts to improve the accountability of government institutions.